Former tradesman, Ibrahima Diallo is living in rented rooms in a Bamako suburb with around forty other members of his family. CRS is doing monthly cash distributions for people like Ibrahima and his family, who have fled their homes in Northern Mali, after extremist rebels took control of the area. 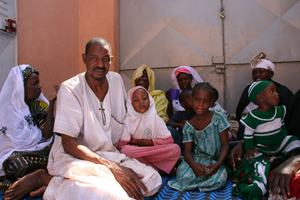 Caritas is launching a wide-ranging response covering four countries to help those affected by the recent conflict in Mali which has uprooted hundreds of thousands of people from their homes. A 3,055,134 euro (US$4 million) programme will strengthen Caritas organisations in Mali, Burkina Faso, Niger and Senegal so they can help the hundreds of thousands of Malians affected by the crisis. The prime focus of the programme is to provide aid to the internally displaced, refugees and others who are victims of the Mali conflict. “The funds given to this emergency not only give us the chance to extend our solidarity to Malian refugees in a time of need but they also invest in helping Caritas organisations in the Sahel respond to the emergency together and to have a good grounding for collaboration on future emergencies,” said Gaston Goro, head of emergencies at Caritas Mali. Over 5000 families (30-35,000 people) in Mali and Burkina Faso will be supported with food rations for three months. Caritas will provide a further 1000 refugee families in Burkina Faso with cash to buy animals for farming. Farmers in the region will receive cash transfers to vaccinate and de-worm their cattle. Over 4000 households in Mali and Niger will receive either cooking kits or tents or mattresses, depending on their needs, while 500 households in Burkina Faso will receive solar cookers. Caritas will support refugees, the displaced and returnees in other ways such as by giving them seeds so they can farm again, providing children with school kits so they can go back to school, providing healthcare and covering the transport costs of people who want to return to their homes. Investment in staff training and improved logistical support will ensure that Caritas member organisations in Mali, Niger, Burkina Faso and Senegal are better prepared to work together on future crises. For more information, please contact Michelle Hough at hough@caritas.va or call 0039 334 2344 136.